We love running our race cars and we love watching people drive them, and lately we’ve been doing a lot of both! So me people were driving a race car for the first time and others wanted to move up the ranks and learn how to handle faster machines. In the past few months we’ve seen it all. 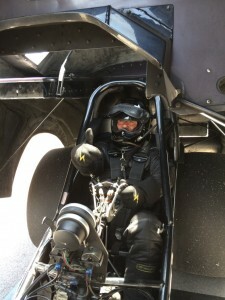 From running corporate classes to teaching US Navy Seals and Hollywood celebrities like Jay Leno to helping a guy achieve his life-long dream to drive a NHRA Nitro Funny car…it’s been a lot of fun. One of our best moments was working with a group of active US Navy Seals at our school in Fontana. 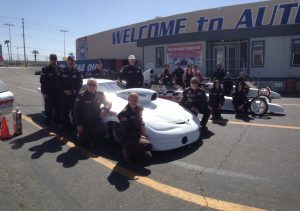 The group was hosted by Mickey Thompson Tires. M/T is a big supporter of the US Armed Forces and bringing these guys out was quite a thrill. The Seals had a great time driving and we had a great time visiting with them. 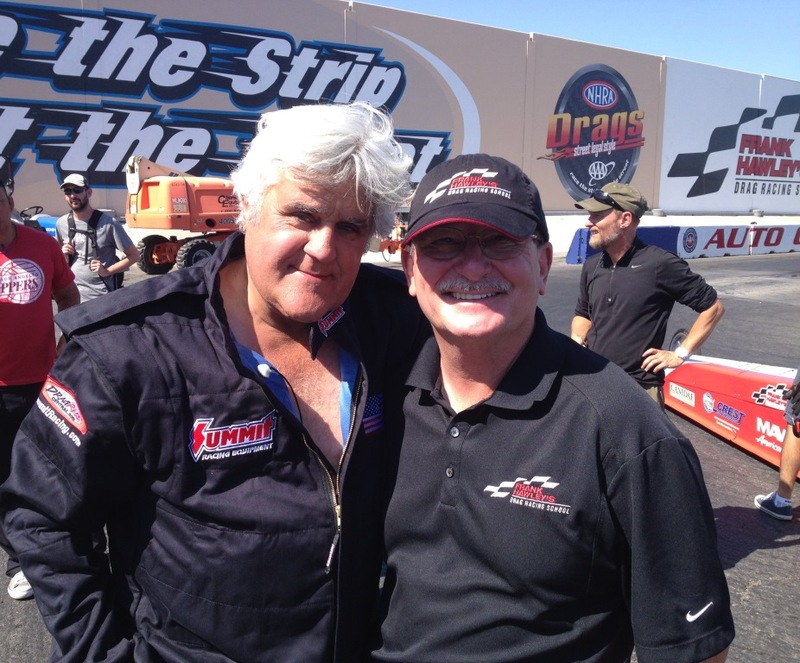 Another highlight was working with a star like Jay Leno. Jay has a new show called “Jay Leno’s Garage” which airs on NBC. 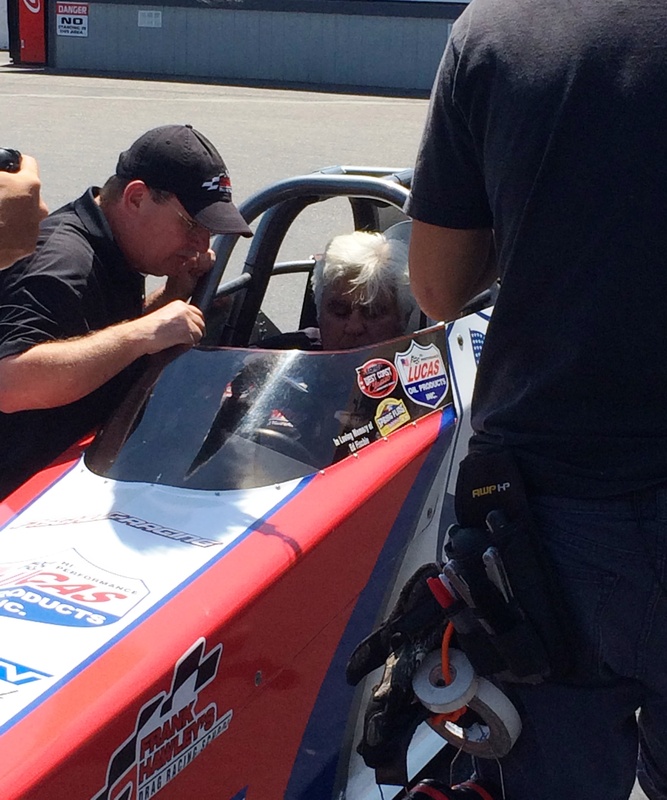 The show’s producers contacted us about filming a segment in which Jay learns how to drive a Super Comp dragster. The show also featured the “not yet in production” 2016 SS Camaro. It was great to have our former student and current Pro Stock NHRA world Champ Erica Enders show up to help with the class. We were asked not to divulge anything about Jay’s on track performance until the show airs in October. We’ll let you kno w when it will be on and then give you a little behind the scenes story as well. Thanks to Jay and all his staff…. great people! Companies have been bringing their customers and employees to the school for some great side-by-side racing action in our Dragster Adventure programs. 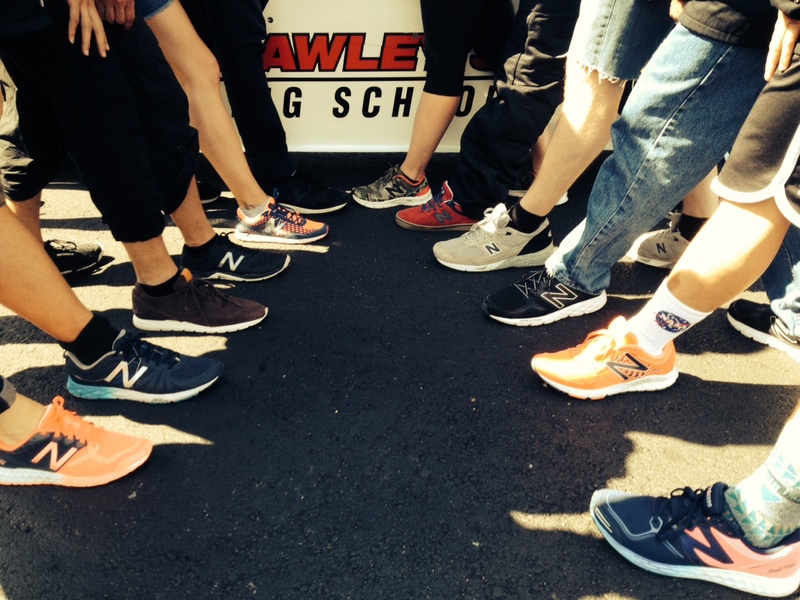 A group of designers and engineers from New Balance shoes showed up. New Balance is working on shoe designs that can enhance a runner’s acceleration and wanted to experience some acceleration “dragster style” before sitting in on a lecture Frank gave on the physiology of human reaction time. 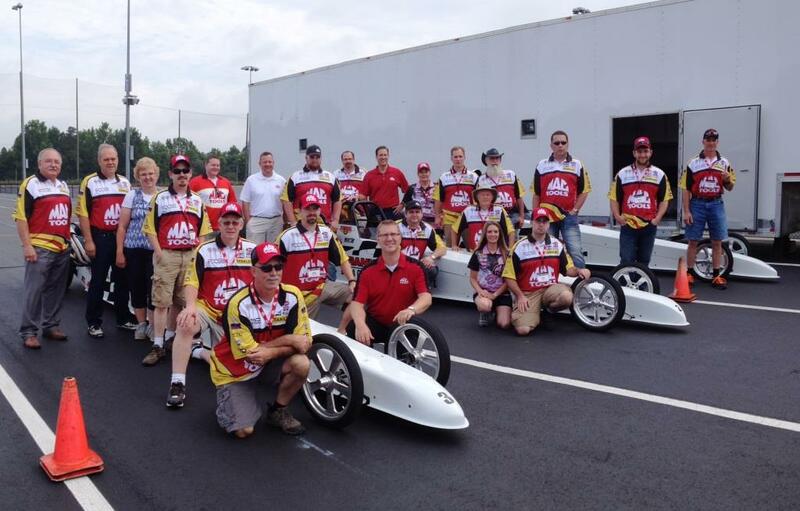 The school of course travels to many locations and the MAC TOOL company recently invited us to ZMax Dragway in Charlotte where MAC assembled a group of their top dealers from the US and Canada for a day of dragster racing. The on-track action was awesome and the racing was crazy close. And then there are guys like Jim Campbell. Jim is a firefighter and works in relief efforts at major disasters around the globe. But he had a dream of one day driving an NHRA Nitro Funny Car. Dream BIG… right? Well, he did it. 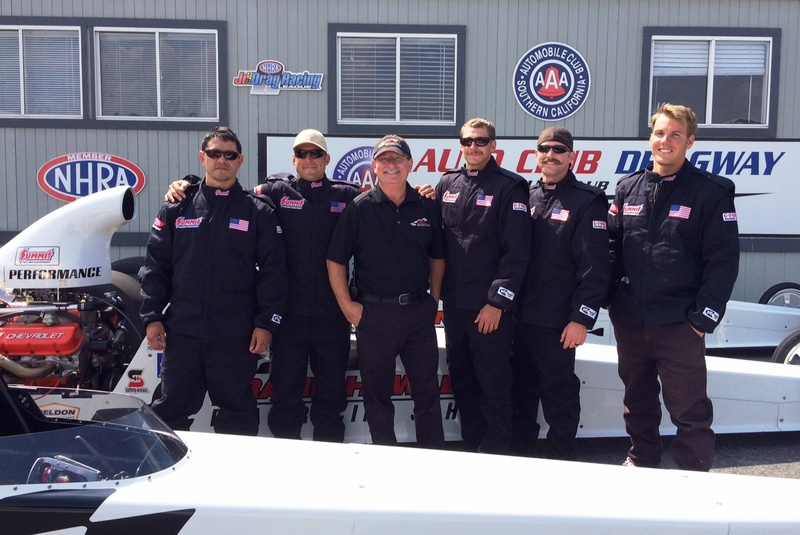 We got Jim through a couple of our programs and “up to speed” in our Nostalgia Funny Car. That earned him the chance to try out the “big” car. 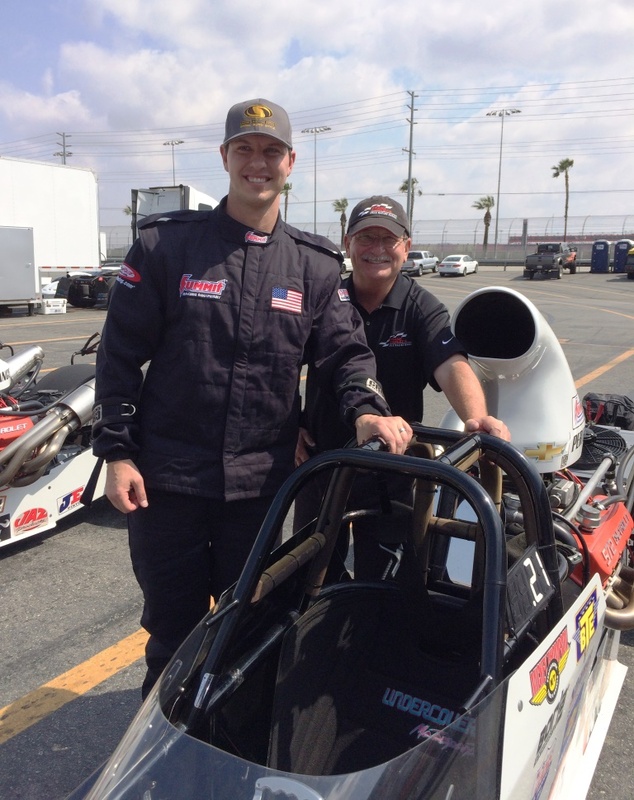 Last week with Jeff Arend and Del Worsham at his side Jim made his qualifying passes in the Worsham car and earned his Nitro FC license. How cool!! In addition to all of this we have been fulfilling lots of other dreams for folks that want to scratch something off their “bucket list”, just have some fast fun or find a shorter route to the winner’s circle. Class pictures follow from our popular two-day Super Comp/Super Gas license programs conducted at Auto Plus Raceway in Gainesville, FL, our West Coast home at Auto Club Dragway in Fontana, CA, Royal Purple Raceway in Houston, TX and Bandimere Speedway in Denver, CO. Contact us for more information on any of our programs or to schedule your date! 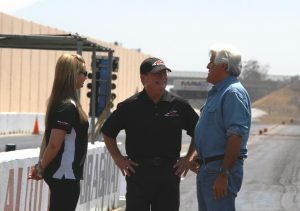 This week I had the opportunity to help Jay Leno learn to drive a dragster for a segment on his show “Jay Leno’s Garage”! Everyone in America knows the name “Jay Leno” and most likely everyone knows that Jay is a huge fan of the automobile. His personal collection of cars is one of the largest and most impressive in the country. Jay loves new cars, old cars, fast cars, slow cars and race cars. And he loves to drive them! 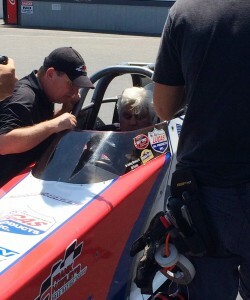 So when the folks from the television show “Jay Leno’s Garage” called me and said Jay wanted to learn to drive a dragster… I jumped at the chance to work with him! Although Mr. Leno has a lot of experience in fast cars, I thought I could use a little help with the instruction, so my friend, former student and current NHRA Pro Stock World Champion Erica Enders stopped by to give me a hand. As a bonus, Erica showed up driving a brand new, not yet in production 2016 SS Camaro…and I got to drive it! We had an absolute blast and Jay and his team were a joy to work with. The location was Frank Hawley’s Drag Racing School’s west coast home at Auto Club Dragway in Fontana and it was possibly one of the most memorable days I’ve had at a drag strip. While you’re waiting for our show check out “Jay Leno’s Garage” on-line and take a look at all the other great cars Jay has gotten to drive in the past season. The details and the outcome of Jay’s performance on the track won’t be released until the show goes on air in October but we’ll stay in touch with everyone and let you know an exact air time. It’s going to be a great show… you really don’t want to miss it. 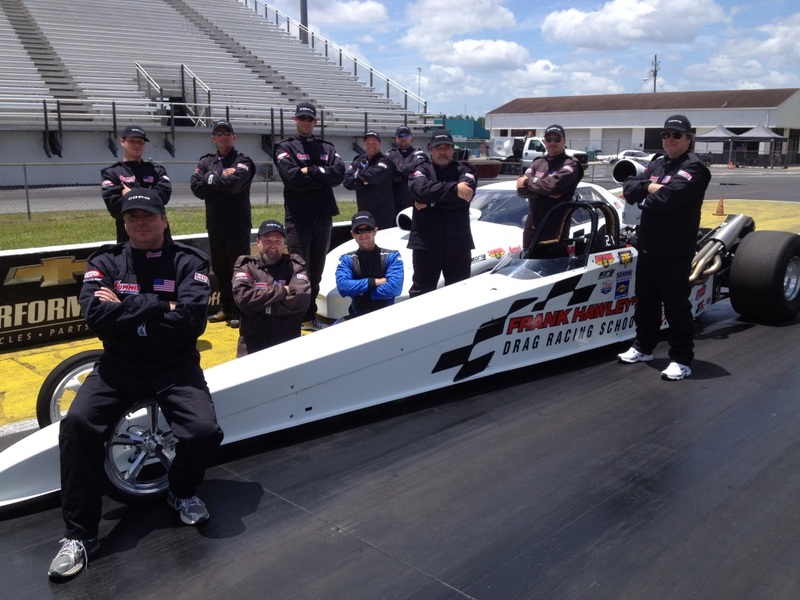 Much like the man himself, Frank Hawley’s Drag Racing School has been to race tracks everywhere, forming partnerships with the biggest names in motorsports. One of the school’s long-time relationships is with Mickey Thompson Performance Tires, founded in 1963 by Mickey Thompson and Gene McMannis. Both drivers held numerous records in various forms of racing and that desire for speed continues throughout the company today. 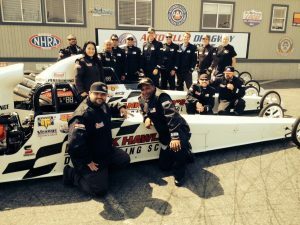 Recently at a Frank Hawley Drag Racing School event for Mickey Thompson customers at the Auto Club Dragway in Fontana, CA several customers and special guests got a chance to get behind the wheel of Hawley’s Adventure Dragsters for some ‘side-by-side’ racing action. After completing practice runs in the morning drivers were paired off for eliminations. The eventual winner was Paul Giddings from SoCal Auto Style in Wildomar, CA. Check out some previous Challenge Winners HERE! 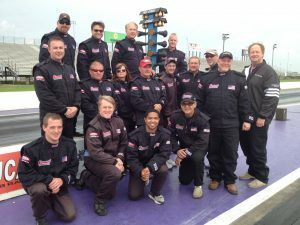 To book your own adventure, visit www.frankhawley.com to see when we’ll be at a track near you or contact us to schedule your own group day at 866-480-7223! Follow us on our official page on Facebook at facebook.com/FrankHawleysDragRacingSchool! Recently five US Navy SEALS based at the Naval Special Operations base in Coronado, CA visited Frank Hawley’s Drag Racing School at Auto Club Dragway in Fontana, CA. The SEALS were invited as part of a program conducted by Mickey Thompson Tires. Frank Hawley’s Drag Racing School has been working with the Mickey Thompson Tire Company for over a decade. 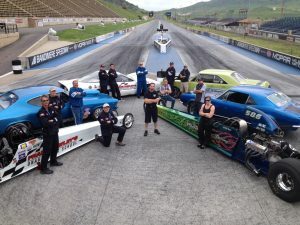 Through the years hundreds of Mickey Thompson customers, staff and guests have gotten a chance to get behind the wheel of one of Hawley’s dragsters and blast down the 1/4 mile during special Mickey Thompson promotional programs. 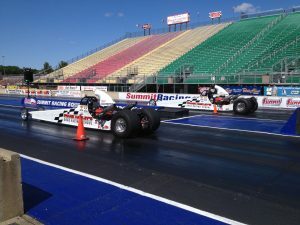 The SEALS got to make several runs in the dragsters in addition to some ‘side-by-side’ racing. Each one said they’d love to return for some more racing. “These guys didn’t just graduate from SEAL training. A couple of them have been SEALS for 15 years.” continued Hawley. “They were treated like ‘Rock Stars’. Everyone wanted a photo taken with them. They were a group of very bright, brave and humble guys and had no problem at all driving the race cars. In fact I was told that after leaving our school they were headed for a different type of training course in a new (not yet released) land based tactical weapons vehicle in Pensacola, FL. Now that is something I’d like to learn to drive!” Said Hawley with a smile. Frank Hawley’s Drag Racing School is open to everyone…not just SEALS! 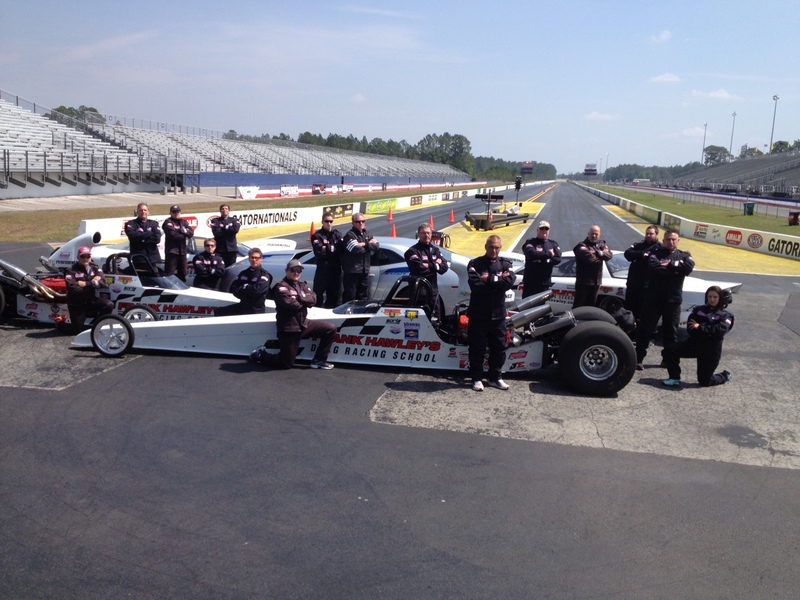 If you’d like to get behind the wheel of a dragster give the school a call at 866-480-7223!